Now essentially a ghost town, Loma Parda was forever changed when Fort Union moved into the neighborhood. Loma Parda became the town where soldiers could go for wild nights. 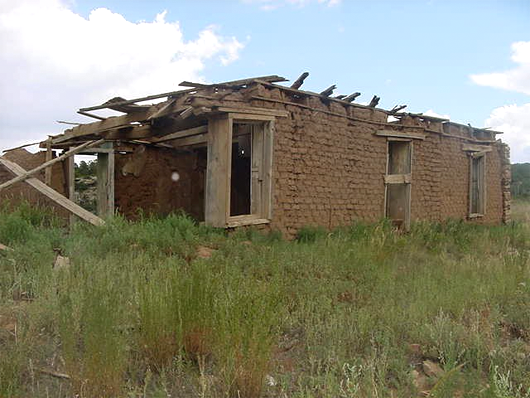 Saloons, gambling, dance halls and women of ill repute put Loma Parda on the map; especially if you were a soldier bored with your isolated existence at Fort Union. When a soldier went AWOL, it was half expected that he was still at Loma Parda either passed out or just too drunk to know where he was. Not all drunken debauchery was on account of the soldiers though; cowboys and teamsters from the Santa Fe Trail engaged in their share of the mayhem. It was in the streets of Loma Parda that a cowboy on horseback grabbed a lady in the street, pulled her across the saddle in front of him, and rode his horse right into the saloon where he demanded that the bartender serve drinks to everybody. Then, when his horse would not drink, he pulled his revolver and shot the horse through the head. He retrieved the lady and left his dead horse on the saloon floor. Loma Parda had a reputation it would never live down. 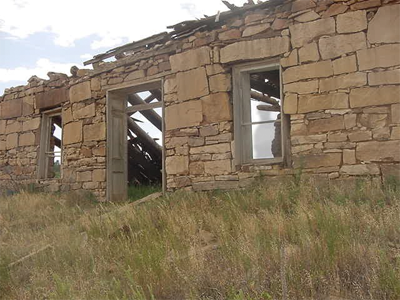 It has a fair number of rock walls still standing, and is considered a ghost town, even though it is still occupied by a few souls. Once a vibrant community tucked down in this magnificent river valley, it was a place where legends were made. When the importance of Fort Union began to fade, so did Loma Parda. The post once lasted until 1900, or nine years after the fort was abandoned. A few families kept farming in the area, but by World War II it had been abandoned entirely. The only bridge into town washed away in 1948 and has never been replaced. A footbridge now provides access to the town. Shadowy figures have been seen roaming about the town ruins at dusk by tourists and locals. The stories here vary. Many say that the old townsite is haunted by the spirits of prostitutes who come down from Cafion de Las Pelones. Other reports claim that the ghosts are lost souls who lost their lives in the town sometime during its violent past. Driving north from Las Vegas on NM highway 518 to Mora at 26 miles turn right onto New Mexico 161. Go appx 14 mile and turn left and cross the cattle guard there will not be a sign. Loma Parda will be about 1.4 miles ahead. Check locally for road conditions. There are no services so be sure to have a full tank of gas and food and water.